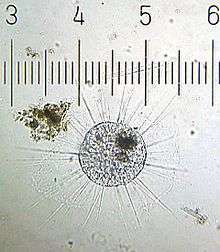 The actinophryids are small, familiar group of heliozoan protists. They are the most common heliozoa in fresh water, and are especially frequent in lakes and rivers, but a few are found in marine and soil habitats as well. Each actinophryid are unicellular and roughly spherical in shape, without any shell or test, and with many pseudopodia supported by axopods radiating outward from the cell body, which adhere to passing prey and allows it to roll or float about. The outer portion of the cell, or ectoplasm, is distinct and is filled with many tiny vacuoles, which assist in flotation. This is very similar to the process of osmosis. The movement of water from inside the cell to the outside is not because of water concentration in this case. It is the cell pushing the excess water out. A few contractile vacuoles around the periphery of the cell expel excess water, and are visible as clear bulges when full. There are two genera included here. Actinophrys have a single, central nucleus. Most are around 40-50 μm in diameter, with axopods up to 100 μm in length, though this varies. Actinosphaerium are several times larger, from 200-1000 μm in diameter, with many nuclei, and are found exclusively in fresh water. Two other genera, Echinosphaerium and Camptonema, have been described but appear to be synonyms. Reproduction takes place by fission, with open mitosis. Under unfavourable conditions, the organism will form a cyst, which is multi-walled and covered in spikes. While encysted it may undergo a peculiar process of autogamy or self-fertilization, where it goes through meiosis and divides to form two gametes, which then fuse together again. This is the only form of sexual reproduction that occurs within the group, though it is really more genetic reorganization than reproduction. The axopods are supported by microtubules arranged in a unique and characteristic double-coil pattern. In Actinophrys, these arise from the nuclear membrane, while in Actinosphaerium some do and others don't. Other heliozoa where the microtubules arise from the nucleus have been considered possible relatives, and it now appears that the actinophryids developed from axodines such as Pedinella. These are specialized heterokont algae, related to golden algae, diatoms, brown algae, and the like, which have microtubule-supported tentacles. Actinophyrys feeds on small flagellates, cilates, and algae, etc.